The 2016 county champions St Thomas’ over powered defending champions Liam Mellows on a magnificent winter’s afternoon for hurling last Sunday at Pearse Stadium to claim a third Tom Callanan Cup in seven years - winning with some ease on a score-line of St Thomas’ 2-13 to 0-10 for Liam Mellows. This was an outstanding display by Kevin Lally’s squad, dominant from the off, in disposing of the challenge of Louis Mulqueen’s men for the second time this season. Few would have predicted St Thomas’ would replicate the nine-point defeat they dished out to Mellows in the group phase again on county final day, however, that is exactly what they did, with goals by Man of the Match Darragh Burke, and captain, Conor Cooney, in each half crucial to their success. Right from the off St Thomas’, aided by a healthy breeze at their backs, tore into the city side and quickly established dominance both physically on the field of play, as well as on the score board. Galway captain David Burke opened the scoring with a superb early strike and brothers Eanna and Darragh (two ) quickly followed suit to stretch St Thomas’ 0-4 to 0-0 in front early doors. Mellows had not settled, but Conor Hynes earned a free which Adrian Morrissey duly dispatched over the bar, and that appeared to help ease the defending champions into the game, with Morrissey tagging on two further placed balls to reduce the gap to one. Darragh Burke soon struck for the half’s decisive score however, capitalising on an error by Mellows' goalkeeper Kenneth Walsh’ whose spilled ball was flicked towards goal and flashed to the back of the net. Conor Cooney and James Regan pointed either side of Burke’s strike to put St Thomas’ in a strong position - but Mellows fought back and earned themselves three further frees which Morrissey slotted to leave it 1-7 to 0-6. St Thomas’ though upped it a gear from there until the break, notching three points without reply through Darragh Burke (two ) and Eanna Burke with his third of the half to leave seven between them at half time. A quick start to the second half was a must for Mellows and they had the chance to hit the back of the net early doors, but twice Conor Kavanagh and Enda Fallon were denied by Gerald Murray and Cathal Burke. Those missed opportunities would prove costly with Darragh Burke going on to hit the next three scores for his side. Mellows replied in that time courtesy of a point by midfielder Kevin Lee after 35 minutes, their first from play in the game, and from Conor Hynes. Their challenge would be ended for good on the three-quarter mark when Eanna Burke turned over possession on the Mellows 21-metre line, before popping a hand pass to Conor Cooney who had ghosted in unmarked, leaving the Galway star with the simplest of finishes past Walsh. That put St Thomas’ 2-13 to 0-8 ahead and incredibly, they would not score again thereafter as the game lost all shape and intensity which had been so prevalent before. Mellows did work to try to engineer the goals they so desperately needed but St Thomas’ proved equal to the task each and every time. Fintan Burke typifying the St Thomas’ resolve, plucked three long, dangerous balls from the clouds in succession near the end and clearing to avert any danger. Tadhg Haran and Jack Forde did fire consolation points for Liam Mellows but it was St Thomas’ day. It was their year in fact, the only undefeated team in this year’s championship, as they quite rightfully became the most successful club in the county this decade. St Thomas’: G Murray; D Sherry, C Burke, C Mahoney; F Burke, S Cooney, D Cooney; J Regan (0-1 ), David Burke (0-1 ); C Cooney (1-1 ), Darragh Burke (1-7, 0-2 frees ), E Burke (0-3 ); B Burke, B Farrell, D McGlynn. Subs used: K Burke, C Kelly, M Caulfield, S Skehill, D Finnerty. 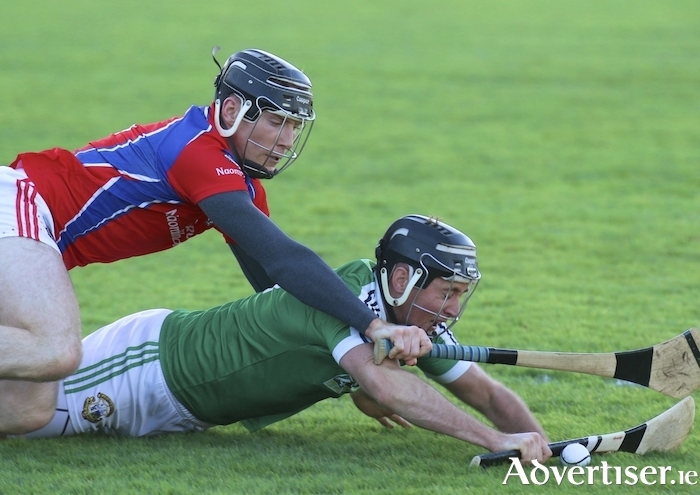 Liam Mellows: K Walsh; B Leen, S Morrissey, C Reilly; M Hughes, D Collins, M Conneely; K Lee (0-1 ), J Hastings; C Hynes (0-1 ), A Morrissey (0-6 frees ), T Haran (0-1 ); E Fallon, C Kavanagh, A Callanan. Subs used: R Elwood, J Forde (0-1 ), S Barrett, C Elwood.